At Cheer Intensity we want to share our knowledge and passion for the sport of All Star Cheer with those who join our family. We aim to use cheerleading as a tool in which to train the bodies of our athletes, but also to train them to be positive and constructive members of society. We hope that through the dedication of our staff, the attention to teamwork, and the discipline that comes along with being a part of our gym, each and every member will leave our program with new knowledge and a heightened confidence. We want to work in conjunction with parents and teachers to instill responsibility, motivation, and respect. The memories that are created and the lessons that are learned while being a member of a Cheer Intensity team are something that will stay with the athlete for years to come. 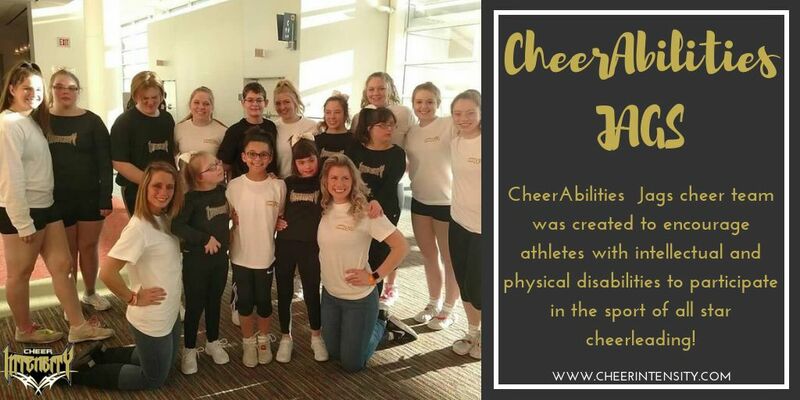 CheerAbilities Jags cheer team was created to encourage athletes with intellectual and physical disabilities to participate in the sport of all star cheerleading. This sport is structured to increase an athlete's physical strength, understand the importance of learning to be on a team, and most importantly to have FUN. Our specialized team encourages the athletes to try new things. This results in the athletes believing they can achieve skills on the competition floor. This program is about team and having every athlete learn to rely on one another to achieve success. CI wants to allow the opportunity for them to feel accomplished! Sign Up to be on Jags on Friday, September 21st between 4:00- 6:00PM. Practices will begin on Wednesday, September 26th from 5:00- 6:00PM.